Time zones are hard, but they don’t have to be. With The Clock for iOS and the Mac, you can stay in touch with friends and family and schedule meetings with colleagues scattered across the globe without the confusion that time zones can cause. The hallmark of The Clock is its flexibility to work the way you do. The app has 20,000 users, and it’s their input that has helped it evolve into an intuitive and essential utility. Times and dates can be displayed in a bunch of formats, but that’s just the start. The Clock includes four handsome themes and supports eight different complications that display information like sunrise and sunset times, business hours, days off, days of the week, time zone offset, and more. The Clock is also indispensable for planning meetings. With calendar integration and a unique slider interface, it’s easy to find a time window to chat with colleagues spread around the world. The app also automatically adjusts for Daylight Savings Time and alerts you as the time change approaches. The Clock is the best world clock you’ll find anywhere on the Mac or iOS. Learn more about The Clock for macOS and download a trial version from the app’s website. While you’re there, check out the iOS version too. Both the macOS and iOS versions are available on the iOS App Store and the Mac App Store. 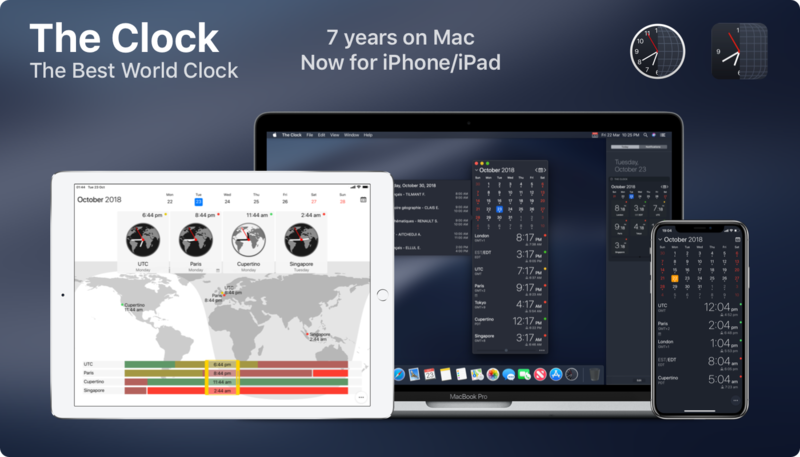 Also, we’re giving away 20 copies each of the Mac and iOS versions of The Clock to MacStories readers. Click here, to learn more and enter the giveaway. Our thanks to The Clock for sponsoring MacStories this week.